How are we going to afford to pay him $31.5 million next year? Stafford also will receive a base salary of $4 million this year, pushing his total payout for 2013 to $31.5 million. He didn't take a salary cut from his quasi guaranteed $43 million between this year and next. He did a simple restructure, pushing salary into next year, and added three years. Appears to be this year, not next. That said, 'we' aren't paying him anything, WCF is and as long as it fits under the cap, what difference does it make? I'll have to see the numbers, and how it all works out. It makes a difference because it has to do with the management of the team and the talent we can afford at other positions. By your logic, we're not winning and losing games, they are, so... what's the difference? If it were baseball it would make less of a difference, but with a salary cap, of course it matters. I'll have to see the numbers, and how it all works out. Agreed, too early to tell anything at this point. It makes a difference because it has to do with the management of the team and the talent we can afford at other positions. By your logic, we're not winning and losing games, they are, so... what's the difference? Exactly, THEY are the ones that play the games, we're just the fans. IMO too many fans take what the teams do personally. Sometimes we'd all do well to remember its just a game. Details of Matthew Stafford's contract agreement with the Detroit Lions, which emerged Thursday morning, provide new clarity on the Lions' five-year roadmap while also suggesting the timing of their next flashpoint. In the short term, the Lions gained $3 million in cap space for 2013 and $3.5 million in 2014 via Stafford's extension, based on numbers in the ESPN Stats & Information database. They now have just under $5 million in cap space available, which they can use this year or declare it a surplus and push it into next year. The latter strategy might be preferable considering that, in 2014, the Lions have more than $50 million in cap space committed to Stafford, receiver Calvin Johnson and defensive tackle Ndamukong Suh alone. Stafford's cap value, detailed in the chart, is relatively reasonable through the 2015 season, topping out at $17.72 million. But it then jumps to $22.5 million in 2016 at the same time Johnson's cap value jumps to $24.09 million. Both numbers are large for reasons that were largely unavoidable, as we discussed Wednesday. If left untouched, Stafford and Johnson project to account for more than a third of the Lions' total cap space by 2016 and beyond -- suggesting that one or both contracts will need to be addressed again at that point if not before. So it's reasonable to expect Stafford to play out the next three years of this deal, during which his $41.5 million in guarantees will be paid out. But if all goes well, the Lions might be well served to extend him again after the 2015 season. Related: Here is the podcast of Stafford's appearance Thursday morning on ESPN Radio's "Mike and Mike in the Morning." I think they did pretty well with the contract considering the mess they had to work with because of the restructures and Stafford's awful rookie deal. Now they have the ability to make a few more moves or just push the money to next year. I really like that they only made it a 3 year addition, so they can reevaluate things again in 2 or 3 years as long as they don't start restructuring again. So obviously, the $27 Mill includes old signing bonus money plus new signing bonus That will count $X Mill divided by the 3 new years on his contract. I wouldn't touch his contract again until after the 2017 season. Given what QB's are getting nowadays, we got a bargain. After 2017, if we have to, we can just slap him with the franchise tag, ( if necessary to keep him ), and then negotiate based on his previous performance. Or we could let him walk if he has not won anything of significance, ( Playoffs games/Super Bowl ). Remember 2008? The losing. The embarrassment. The shame. That was the Detroit Lions. They were the worst team in the National Football League. Ever. A joke. They embodied futility. They didn't win a game. It was painful and wretched and sad to see men broken. That season cost plenty of good people their jobs. And it led Matthew Stafford to his. After the Lions this week extended Stafford's rookie contract to 2017 and gave the 25-year-old $41.5 million in guaranteed money, former longtime quarterback Donovan McNabb said Stafford didn't deserve the money. "Is he worth top-five money? I would have to say 'No,'" McNabb said on NFL Network. "And I say that because it's about wins and losses. 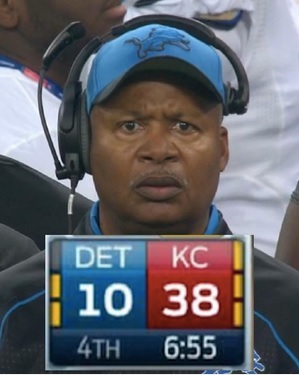 And what has he really done for the Detroit Lions? Nothing." Lions QB Matthew Stafford talks about whether he feels any additional pressure after signing a contract extension, Detroit's addition of Reggie Bush, Calvin Johnson's role and more. Stafford has done nothing except lead the Lions out of the morass of 2008. Nothing except make one of the oldest franchises in the league relevant -- not to mention interesting -- again. Nothing except lead Detroit to the playoffs in 2011 for the first time since 1999. Stafford has done nothing except throw for more than 10,000 total yards the past two seasons -- more than any other quarterback except Tom Brady and Drew Brees -- while the Lions have continued to rebuild from 2008. Stafford has averaged more passing yards per game during his first four seasons than anyone except Kurt Warner with the St. Louis Rams (1998-2001), according to ESPN Stats & Information. After starting all 16 games each of the past two seasons, Stafford has shed the reputation of being fragile. He has become one of the Lions' unquestioned leaders and hardest workers. And he has developed an innate connection with the Lions' most important asset, Calvin Johnson. Has Stafford been launched into the Brady-Brees-Manning-Manning-Rodgers stratosphere yet? No. Has Stafford had the playoff success of Joe Flacco or the consistency of Matt Ryan, each of whom has played one season longer? No. Has he notched wins against the elite teams? No. McNabb is right that quarterbacks are judged on wins and losses. Fair or not, they get too much credit for the wins and too much blame for the losses, and quarterbacks are the only players with a win-loss record attached to their names. But when evaluating Stafford and his 1-22 record against teams that finished the season with a winning record, there must be context. This isn't an excuse, merely an explanation: Stafford took over a sorry team. The Lions in 2009 were the ultimate rebuilding job. They were starting anew with a first-time head coach, a new coaching staff and a rookie quarterback. The Lions didn't have the talent or depth defensively that the Philadelphia Eagles did in 1999, when McNabb was a rookie starting quarterback. During the early part of McNabb's career, the defense was loaded with playmakers and carried the Eagles. It wasn't until 2004, when Terrell Owens joined the team and running back Brian Westbrook emerged as a dual threat, that Philadelphia became known as an offensive juggernaut. Detroit has many more pieces in place now than it did in 2009, and securing its franchise quarterback, even with two years remaining on his rookie deal, had to be a priority. The Lions, to an extent, are banking on potential, which often is risky. They are counting on Stafford to continue making progress, to become more consistent, to limit his turnovers and to maximize his strong arm. There is no reason to think Stafford can't. He has shown impressive flashes. He can thread the ball into the narrowest window. He has the arm to find Johnson deep past a defender. There are times when Stafford has looked unstoppable. With him, it is about extending those streaks and about continuing to grow and becoming the leader the franchise needs him to be at this stage of his career. The day Stafford re-signed, Lions president Tom Lewand said Stafford has what longtime Michigan coach Bo Schembechler called "moxie." "It's that something else that's hard to define," Lewand said, "and Matthew has that." There is always risk involved when forking over significant guaranteed dollars, but Detroit did the right thing. After years of a revolving quarterback carousel that included the likes of Jon Kitna, Joey Harrington, Dan Orlovsky, Daunte Culpepper and a 35-year-old Jeff Garcia, the Lions have stability at the most important position. There is no quarterback controversy, no quarterback question. For the fifth year in a row, Stafford enters training camp as the unquestioned starter. To the Lions, that was worth giving Stafford more guaranteed money than any quarterback except Brady, Brees, Tony Romo, Aaron Rodgers, Flacco and Sam Bradford. Asked to compare his extension to that of Brees or Rodgers, Stafford said: "Hopefully, a Super Bowl ring. That's what those guys have: league MVP, Super Bowl rings, years of experience doing it, all of that. You know, I think that's what is a great opportunity for me the next four or five years -- to get to that level and hopefully stay with this organization for a long time." Given its ignominious history, given the fact that the franchise has won only one playoff game in the Super Bowl era and hadn't had a winning season since 2000 before Stafford arrived, Detroit happily gave Stafford an extension. There's no reason to think Stafford won't be the player he was in 2011, when he threw for 41 touchdowns and 5,038 yards, or that he won't be more consistent with a legitimate running game. To the Lions, Stafford's potential and previous contributions are worth something. They've been to the bottom. They've seen the view looking up. They know better than anybody what nothing looks like, and Stafford has contributed much more than that. McNabb was benched for rex grossman for losing to Stafford & the Lions. McNabb was also benched in MN(effectively ending his career) after blowing a 20 point lead to Stafford & co. I don't think it has anything to do with it. Honestly, I see stuff like this all the time, with people making comments (here and elsewhere) that somehow people that weren't great players don't have a right to comment. That makes no sense. Were that truly the case, none of us would have a right to be making any comments on it. Not to mention the fact that very often, the greatest players aren't the best evaluators of the game. I think this stems largely from the fact that most truly great players are physically gifted to some extent, so they don't have to study or do the mental work as the guy who doesn't have those same physical gifts. Then later in life, those guys who have been evaluating and figuring out things mentally will be better at the analysis type roles. Case in point: look around any pro sports league at how many of the coaches or front office people are former great players. Then look at how many of the great ones are former great players. There's not many. In almost every case, great analyzers of the game are guys who either came up doing it their entire lives, or weren't star players so they had to spend more time evaluating and analyzing during their playing days. First of all, I think Donovan McNabb was a great player. I don't know how good of an analyist he is but I agreed with him last season about Stafford's decision making. I just enjoy making fun of the guy. I'm cool with him criticizing the contract but he said "What has he done for Detroit? NOTHING". Well he ended a huge losing streak vs. YOU and he made a great comeback against YOU. Both games cost Donovan his job. I never said he had no right to comment, just as a Lions fan I felt compelled to observe Stafford's ownership of Donovan McNabb. I dont have a problem with the total money on the deal but I question why they would extend Stafford with 2 years remaining on his contract. He is coming off IMO a very disappointing season, one where he depended on a star player and showed little ability to get much out of the supporting players in the receiving unit. We can scapegoat Titus Young, perhaps, or Ryan Broyles and Burleson's injuries but still Stafford has struggles of his own last season. My second point is that with 2 years remaining on the contract, what was the urgency of getting the deal done right now particulary at this point in the offseason? My understanding of this deal is that it lowers cap figures in the short term and increases them in the future. But why lower cap numbers late in the offseason when the high end free agents are already gone? The Lions were already under the cap so why not save the extension for immediately after next season when the cap space it would have created could allow for addition of a significant free agent to the team? At this point in the offseason its possible to add a cut player but usually you dont need to pay big to get those players this time of year. Maybe I d understand it more if they had a trade lined up where they were going to trade a draft pick to take on the salary of an established LT or high end No 2 caliber WR. Otherwise, the timing and use of cap space make little sense (although I do like Stafford and think they paid around what his market value should be). Legend - as I understand it, the Lions can roll saved cap space from this year into next. So the money we save this year can be used for signing FAs next off-season, or extending Suh. This. Its only bad extension if you think its possible at the end of this next seasont hey mgith want to Not extend stafford at all and search for a new QB. Assuming that was never really an option, and that Stafford is our QB of the future still, now was the time where he had the least leverage and value in Re to an extension, hence us getting a slightly better price than I (and some others) on here expected. The coaches and Mayhew are betting on him rebounding, and us being an up and coming playoff team the next few seasons, meaning he would only get more expensive each year the next 2 years w/o a contract. Also, the only reason this contract seems so high is because we restructured him before pushing so much money down the line. He isnt getting a "Ton" of New money, but we owed him so much it was going to look like a high end deal no matter what we did. Not saying they did the right thing, but all their eggs are in his basket, and in this case , they are betting their jobs that they are right (they were anyways) and so locking him up now saves money in their eyes.